Entry filed under: Thoughts about Crochet, Yarn Stores. 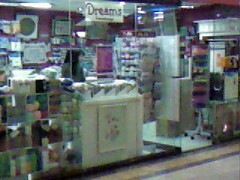 Tags: dreams glorietta 5, Dreams yarnshoppe, yarn store in the philippines. Wrist Band with Button Applique	Still Hyped! This is the only yarn store I’ve heard about in the Makati/Manila/Muntinlupa area. Do you know of any others that might be less expensive? We moved here about a month ago, and I brough quite a bit of yarn with me for projects I was already planning, but I’m sure I’ll need to pick up a ball or two every now and then to go with what I already have. I think some of the unbranded yarns in dreams can also be found there. And they also have monaco/cannon threads there in bigger sizes and cheaper prices. do they have different crochet hook sizes too? I am really having a hard time finding those that I need. I wanted to have the most resources I have as I start.